You can use orange zest if you want a sweeter bread. * To make the purée: microwave the sweet potato, skin on, for about 10 minutes and check piercing it with a fork. It should go straight through it, no resistance at all. In a small bowl mix yeast, pinch of sugar and ¼ cup warm water, until foamy, about 3 minutes. In the bowl of the electric mixer, mix sweet potato purée, buttermilk, oil, sugar, egg, zest and 2 cups flour. With the dough attachment start mixing at medium speed until the dough start to combine. Start adding the rest of the flour, ¼ cup at a time, until you have a springy but slightly sticky dough. It took me the 4 cups. Be careful not to add too much flour and end with a dry dough. Transfer to an oiled bowl, cover with plastic wrap and let rise until doubled, about 1 ½ hours. Transfer to a lightly floured board. With a rolling pin, make a rectangle about ¼ inch thick. You might need to let it rest a minute or two in between a few rolls to get it to the right thickness. Brush evenly with melted butter and sprinkle with the spiced sugar. It might seem like a lot but the result is wonderful.Carefully start rolling from the long side, as you would any cinnamon roll, trying to get a fairly tight rope. Brush two 9×5 inch loaf pans spray or additional melted butter, cut the dough in half and place each into one pan. 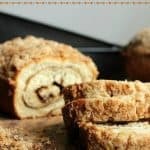 Sprinkle with the streusel, dividing evenly.Carefully start rolling from the long side, as you would any cinnamon roll, trying to get a fairly tight rope. Brush two 9×5 inch loaf pans spray or additional melted butter, cut the dough in half and place each into one pan. Sprinkle with the streusel, dividing evenly. Cover with a clean kitchen towel and let rise again until puffed, about 45 minutes. About 20 minutes before baking, preheat oven to 350ºF / 180ºC. Bake loaves until golden and a tester inserted comes out clean, from 45 to 1 hour. If you use a smaller loaf pan (8×4 inch), it will take longer. Let stand a few minutes after you remove them from the oven, and then invert them onto a wire rack. If you don’t the caramelized rim will harden and make it impossible to remove. You’d have to pop them again into the oven for 5 minutes to loosen it up if this happens. Keep leftover well wrapped in the freezer, already cut in slices preferably if you plan on toasting them. Mix all ingredients except butter in the food processor. Add butter and mix until it start to clump.